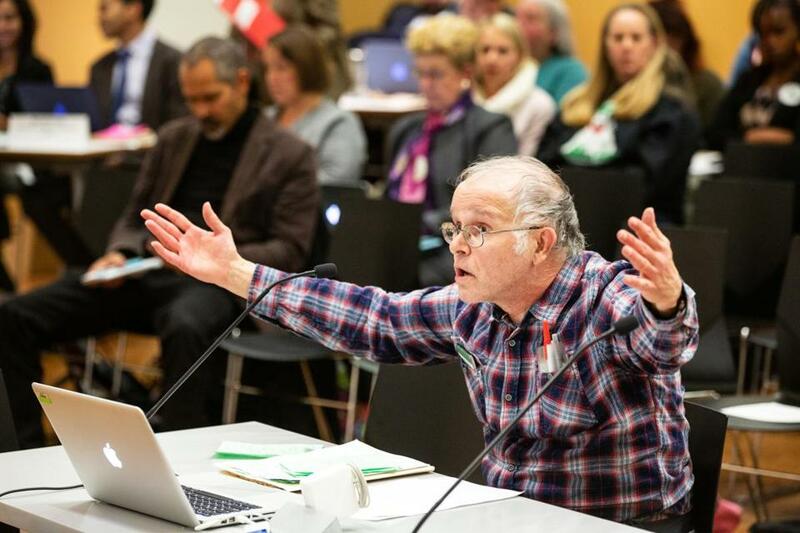 Political activist Mike Heichman of Dorchester, spoke against the school closings during a Boston School Committee meeting held at the Bruce C. Bolling Municipal Building in Roxbury. 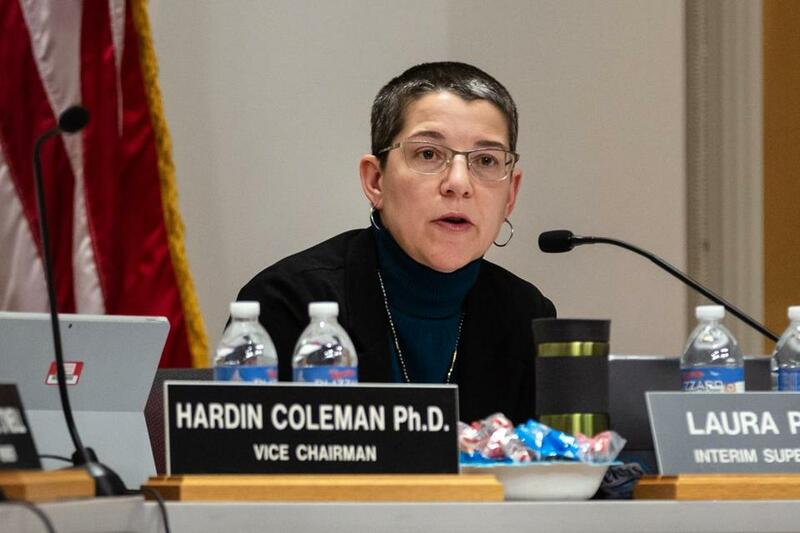 Over the objection of outraged students, teachers, and parents, the Boston School Committee voted Wednesday night to close two high schools in West Roxbury over the next two years. “There is too much disruption to a vulnerable population of students,” she said. Deteriorating building conditions at the campus shared by Urban Science Academy and West Roxbury Academy, which collectively serve 680 students, are forcing their closures, school officials have said. Problems include a crumbling facade and a leaky roof that has caused extensive water damage to the ceiling tiles and floors and may have compromised the electrical system. But students, teachers, and parents have accused school officials of exaggerating the building problems in an effort to cut spending. They warn that the trauma of the closures will cause lifelong harm to some of the city’s most vulnerable students: Urban Science Academy has a special program for students on the autism spectrum, and nearly a third of West Roxbury Academy’s students don’t speak English fluently. More than 100 people attended the meeting, some wearing stickers that said, “Don’t wreck the WREC community,” with the school’s mascot on it, a pirate. Urban Science Academy teacher Amy Eisenschmidt, West Roxbury Academy junior Catari Giglio, 16, and her mother Ingrid Morales applauded for no school closures during a Boston School Committee meeting held at the Bruce C. Bolling Municipal Building in Roxbury. She cried after the vote. Others sighed and quickly left the meeting room. 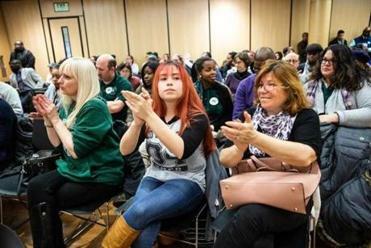 Under the proposal crafted by interim Superintendent Laura Perille, the West Roxbury campus would close in June, but the two high schools would remain open for another year at another site — sharing space with the Irving Middle School in Roslindale. However, the two high schools would educate only the rising seniors. Officials hope the arrangement will prevent any disruptions to their college application processes and other senior year activities and coursework. All other students would transfer to different high schools. Officials argue that the underclassmen will have enough time to get acclimated to their new schools without derailing their education and future college plans, although school supporters disagree. These students would have top priority for placement under the school transfer process. Officials also plan to move some students in groups, such as those in programs for autistic students, to specific high schools. Perille said in an interview prior to the meeting that the school closure recommendations were difficult to make, but the building conditions left the school system with no other options. She also noted that both the schools had been struggling academically. Interim superintendent Laura Perille spoke during a Boston School Committee meeting held at the Bruce C. Bolling Municipal Building in Roxbury. Opposition to closing the West Roxbury high schools extended well beyond the students, teachers, and parents affected by the proposal. In November, nearly a dozen organizations representing civil rights activists, parents, and educators called on the School Committee to halt all school closings until a long-term facilities plan is released, debated, and approved. Although school officials have released a long-term facilities proposal, the School Committee has yet to vote on it. That proposal calls for the elimination of all middle schools, adding the seventh and eighth grades to several academically struggling high schools, adding sixth grades to many elementary schools, an unspecified number of school mergers, and building or reconstructing about a dozen schools, including the West Roxbury high school campus, which another existing high school could eventually move into. Several public officials testified at Wednesday night’s meeting. City Councilors Matt O’Malley and Annissa Essaibi George presented a letter to the School Committee from them, US Representative-elect Ayanna Pressley, and City Councilors Michelle Wu, Kim Janey, and Lydia Edwards urging the board to postpone its vote. “We are breaking a community apart,” said Essaibi George, chairwoman of the council’s education committee, as she advocated for keeping both schools open. Jessica Tang, president of the Boston Teachers Union, also called on the committee to vote against the school closures. 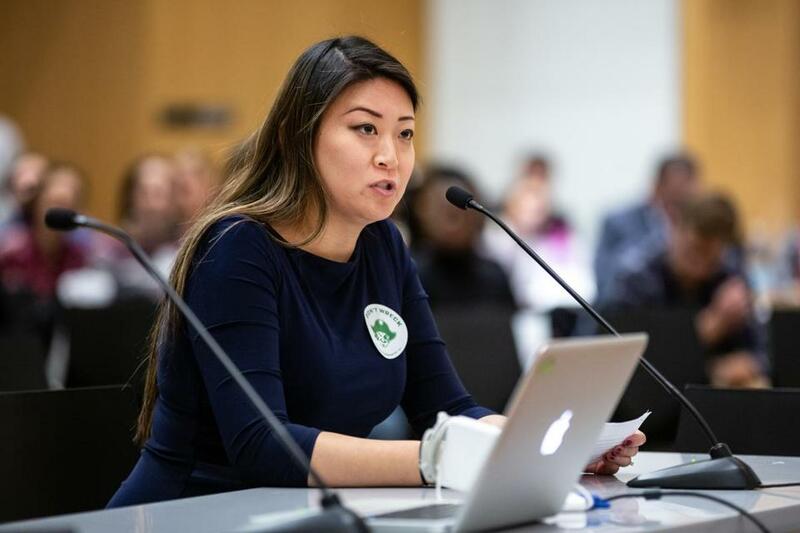 President of the Boston Teachers Union Jessica Tang spoke against school closures during a Boston School Committee meeting held at the Bruce C. Bolling Municipal Building in Roxbury.